Our range of solutions for oil & gas drilling and production include a wide array of products such as gelling agents, friction reducers, emulsion breakers, biocides and scavengers, corrosion inhibitors, and acidizers, all key components of completion or production fluids. 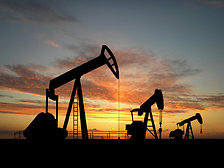 The Oil & Gas industry offers challenging applications for most polymeric materials, demanding high temperature performance, chemical resistance, chemical permeation resistance, toughness and flexibility even at low temperature, excellent electrical insulation and long-term reliability. Solvay provides a wide range of high-performance polymers that meet Oil & Gas critical requirements. For renewable energy production, we develop products & technologies such as films for photovoltaic panels, and seals, cables and epoxy compounds for wind turbine blades. We work with customers to reduce their energy & CO2 costs on their industrial and production sites. Lithium batteries are a challenging application for most polymeric materials, demanding long-term reliability as well as chemical and electrochemical resistance in the specific chemical environment of Li-ion cells. Solef® PVDF brings long term high performances to the lithium battery industry as a binder in the formulation of electrodes and in the composition of the separator. Our LiTFSI lithium salt adds up to 20% to Li-ion battery lifetimes, and improves intrinsic safety and performance for both liquid electrolyte formulations and LMP technology. The ultrapure additives tert-amylbenzene (TAB) and monofluoroethylene carbonate (F1EC) are used in batteries and accumulators to improve the cycle life of lithium ion rechargeable cells containing a graphitic anode. Our specialty polymers such as Aquivion® PFSA, Algoflon® PTFE, Tecnoflon® FKM and solvene® EAP are used for innovative energy generation and storage technologies such as fuel cells, water electrolysis and energy scavenging. F1EC and Solef® PVDF are also used in the batteries for the Solar Impulse plane.